Parasite Eve: The Third Birthday did not start its life out as a PSP title. Oh, no. It began its existence as a Japanese cell phone game. During the late 1990s, Parasite Eve was adapted from a Japanese horror novel into a PlayStation title. A sequel followed in 2000. Then radio silence until 2007 when The Third Birthday was released on Japanese cell phones. According to Square Enix, there was concern because so much time had passed between the second and the third game. What's more, the game was released in installments on the cell phone, allowing Square Enix to respond to player feedback. The cell phone was the ideal testing ground for the new Parasite Eve game. For the upcoming handheld console version, developers who worked on Final Fantasy XIII were able to bring their expertise to the title and help craft a stunning looking PSP title. Like the cell phone title, the PSP game carries the title of The Third Birthday, but that doesn't mean it's not a Parasite Eve title. 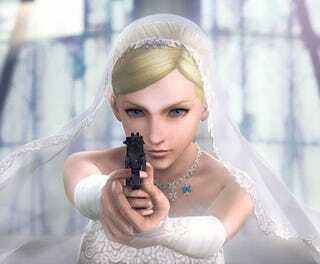 For Square Enix, Parasite Eve is always about protagonist Aya Brea and guns — both of which feature predominately in the game, which is a nifty third-person shooter with a lock-on function.